KitchenAid refrigerators are greatly increasing in popularity because of technology innovations and ease of use. Appliance Electrical Services is proud to announce that it has joined KitchenAid’s roster of factory-trained and expert KitchenAid refrigerator repair service providers, specializing in repair of KitchenAid refrigerators, many of which are Energy Star rated. Just dial (800) 520-7059 and get 25% discount on KitchenAid refrigerator repair service in Los Angeles and surrounding areas! Living with a broken refrigerator is no fun. A unnoticed breakdown of your KitchenAid refrigerator could result hundreds of dollars of spoiled food and higher energy bills from leaks that allow cool air to escape. Should you notice that your KitchenAid refrigerator is not cooling properly or maintaining true temperatures, give AES a call to inspect the outer areas for signs of leaks or more dangerous electrical problems and other internal functioning. KitchenAid, originally known for its stand mixer that was born in 1919, the company has methodically expanded to manufacture all major cooking and cleaning appliances. Now, your local AES expert KitchenAid refrigerator repair technician has earned certification. It is your guarantee that the our KitchenAid appliance repair technician servicing your appliance has gone through rigorous factory training and testing in order to bring high quality service to your home. KitchenAid Recalls: http://www.kitchenaid.com or access information from the U.S. Consumer Product Safety Commission at: http://search.cpsc.gov. KitchenAid expanded beyond mixers in 1949 with a foray into refrigerators which proved successful and by 1985, the company had purchased Chambers Company and incorporated its range of cooking appliances into the KitchenAid brands and added refrigerators into their product line in 1986. In the 1990s added small appliances. It expanded its retail exposure by point-of-purchase exposure at William-Sonoma, Kohl’s, Target, Macy’s and other department stores. Why does AES know so much about KitchenAid? Outside factory-training, AES has enjoyed the knowledge and benefit of KitchenAid’s tour that is also offered to the public, known as the “KitchenAid Experience” which is conducted by assembly line works of the KitchenAid manufacturing plants. Recently, the brand trademarked its marketing moniker, KitchenthusiastTM. AES strives to maintain its reputation as masters in KitchenAid appliance repair. In fact, many of AES technicians are European-trained electrical and mechanical engineers as well as best-in-class appliance repair technicians. As a result, not only do Los Angeles homeowners get expert KitchenAid refrigerator service, but, appliance repair technicians who understand the principals of manufacture behind every KitchenAid appliance. Clearly, with that much brand familiarity, training and expertise, AES provides its customers with a 100% guaranteed and best-in-industry warranties on parts and labor. Have you purchased a new KitchenAid refrigerator or other appliance? Many brands offer an extended warranty when customers use a brand-certified appliance service provider for initial installation. A good start makes great sense all around which is why AES is the best choice when installing, maintaining or repairing your KitchenAid appliance(s). Does your KitchenAid refrigerator need repair? AES understands the inconvenience created by loss of operability of a cleaning appliance. This is why AES stocks most KitchenAid factory original (or manufacturer approved) replacement parts in its service vehicles. With most parts immediately on-hand, repair times are reduced to a minimum. In the rare instance we do not have the part, we can arrange to have it shipped overnight in most instances. Troubleshooting and prevention. KitchenAid Repair Center firmly believes that it is more intelligent and less costly to maintain your KitchenAid appliance than to call for service only when the need become vividly apparent. When you adhere to a regular maintenance schedule with AES, your KitchenAid appliances will last longer and work better. We value time. AES offers same-day KitchenAid fridge repair service in most instances. AES always checks wires, thermostats and general machinery of your KitchenAid appliances and troubleshoots other potential problems with each service visit. Don’t be shy with your questions. Your local KitchenAid refrigerator repair technician is a great personal resource. They will gladly teach you how to optimally operate your KitchenAid refrigerator and other home appliances. In addition, AES technicians are encouraged to obtain and maintain certification from the U.S. Environmental Protection Agency, the International Society of Certified Electronics Technicians and/or the Certified Appliance Professional. AES service technicians are also factory trained in other brands, in the event you have mix and matched your KitchenAid appliances with other brands of stoves, dryers, dryers, cook-tops, vents, refrigerators, freezers, coolers, ice machines, wine cooling & storage units, microwaves, appliances, garbage disposals, trash compactors, washers, dryers, air conditioning/heating, connective systems or other home-related devices. AES dispatchers are available on a 24/7 basis at the company’s toll free number: 800.520.7059. 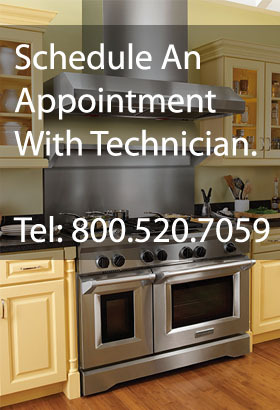 You may also schedule a regular appointment with KitchenAid refrigerator repair technician during office hours or by clicking this link to make a request online.